shear, originally uploaded by jahansell. I've been to Shear Illusions only once - for the most part I happen to have built a loyalty to a salon in Millerton, near where I work. But for a while I was going to a cutter at the Millerton salon who apparently had some issues with authority - he kept leaving one salon and popping up at another. He was a great cutter so I followed him, including when he spent a brief period at Shear Illusions. But when he disappeared again I returned to where I could dash out on my lunch hour for a trim. I shouldn't have neglected to mention the salons, because it's one of the few entrepreneurial paths women take - it's a great business and, I suspect, mostly recession-proof. (This is a digression that doesn't belong here but the point is: forget "equal pay for equal work" - men and women don't DO equal as in the SAME work, they do different work that is equally important but unequally compensated. Around here, the men work in construction trades: plumber, car repair, builder, etc. Women work in child care, house cleaning, waitressing, where the pay is a fraction what it is for the men's jobs. I've long wanted to start a program training women for the construction trades but I'd have to solve the day care problem first!) One fairly well-paying exception to that list is teaching (the more education and skills women have, the smaller the wage gap, I'd bet), and another, perhaps, is owning a salon. 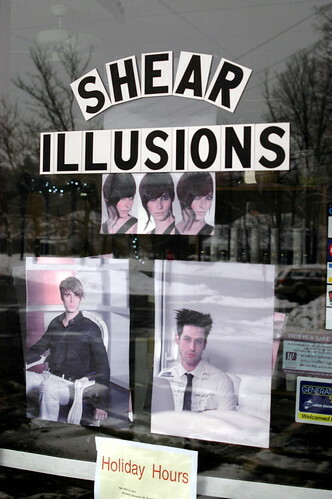 One last note: Shear Illusion is very different from the salons in Millerton, which tend to be trendier (and more expensive). It serves a different clientele (more working class) - as has been pointed out to me, there is no New York bankroll propping it and the other businesses in Sharon. They are for locals, by locals, and we need them to succeed. I've enjoyed the lively discussion in my comments section this week - those of you who are visiting from elsewhere, make sure to take a look and you'll really understand Sharon!